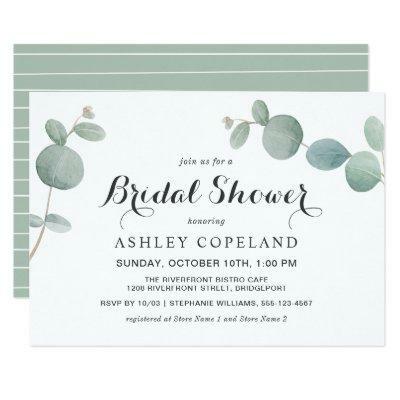 Sprigs of watercolor eucalyptus greenery highlight this modern bridal shower invitation with nature-inspired elegance. This simple versatile design includes a text template for you to personalize with your desired event details. Since all of the text may be edited, you can use this invitation for other events as well simply by changing the title of the event. The green/blue-green color scheme works well in any season of the year. A suite of matching stationery products is available in this design to coordinate your event in beautiful style.